Walnut trees are grown for their beauty, shade and the delicious nuts they produce. ?The black walnut tree? (?Juglans? ?nigra L.? ? ), native to western Massachusetts, can be grown from nuts, although seedlings are more successful. If you are looking for a large tree that lives a long time (up to 200 years, according to researchers at the University of Minnesota), then consider the black walnut tree. 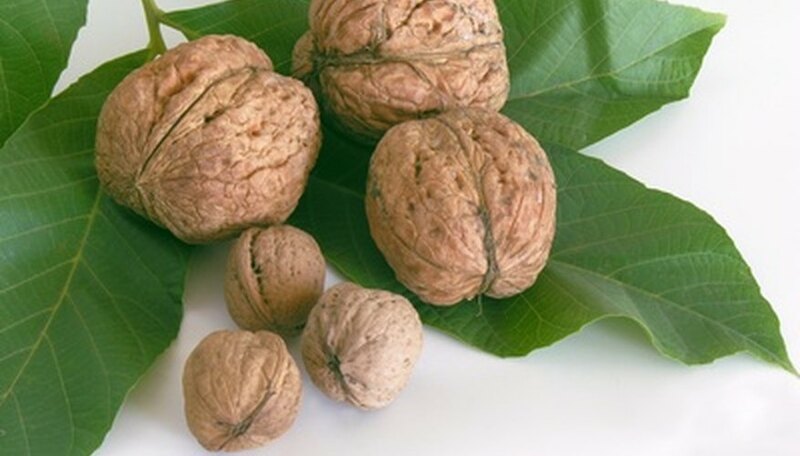 Grow your walnut tree in a sunny area with deep, well-draining soil that is slightly acidic (pH range of 6.0 to 7.5). If you are unsure of the pH, can test it with a home testing kit or take a sample to your county cooperative extension agent, who can recommend corrective measures. Water the walnut tree only when the weather is dry. Normal rainfall patterns in Massachusetts should provide sufficient water for the tree. During dry spells such as summer, water the tree deeply. The most efficient way to do this is to use a soaker hose and allow the water to penetrate the soil slowly for at least an hour. Keep an eye on the soil and water again if it dries out. Remove all weeds within a 3-foot radius of the walnut tree. In Massachusetts these weeds might include bermuda grass, crabgrass, foxtails, curly doc and pigweed. Weeds compete with the tree for nutrients and moisture in the soil. Fertilize the walnut tree monthly, beginning in late spring, with a 6-24-24 fertilizer at the rate recommended on the package. After three years of age, the tree requires no fertilizer. Always water before applying fertilizer. Inspect the walnut tree frequently for pests. In Massachusetts walnut trees are attractive to the walnut caterpillar, aphids, walnut shoot moth and the walnut weevil. Insecticides are effective against these pests, and your county cooperative extension agent can both identify the pest and suggest a suitable spray. Diagnose walnut tree diseases early. The two most common diseases of Massachusetts walnut trees are walnut blight, caused by a bacteria, and walnut leaf blotch, caused by a fungus. Both diseases occur during wet weather, and your extension agent can assist you in finding a cure. Prune the walnut tree during the dormant season. Remove any dead or crossed branches and prune the interior of the tree to allow more sunlight and air to reach it. Walnut trees secrete a substance that is toxic to some plants, which will not grow in the tree’s understory. Be especially careful when planting tomatoes and apples near walnut trees. Walnut Council: Botanical Description ? ?University of Minnesota: Growing Black Walnut ? ?University of Massachusetts: Common Weeds of Massachusetts ?